If I had to walk into a book store spend $90 in gift cards immediately (or lose the $90), and that book store did not have ANY of the 20 titles I planned to purchase, what might I buy? What can I say? I'm a fan of intelligent, well-trained working dogs. I can't wait to eat it. Last year I gave away all but one tiny jar for us, which we promptly consumed. But this year I wised up. Not only did I make 16 jars of jam, but I'm keeping 4 for me. Ahem. I mean, us. I can't believe this guy is already ONE. Time flies. And Nolan runs. Everywhere. I had the absolute joy of attending Nolan's first birthday. It was an adorable outdoorsmen theme. Very appropriate for the son of an avid flyfisherman. ...he wasted no time diving in to the cake. as well as Grandpop, and all the rest of the family. was the wrapping paper, of course! Nolan, thanks for being a riot all year long. From the moment you appeared in this world you wanted to run, run, run, and we look forward to all of your adventures full speed ahead! I just picked, washed, sorted, trimmed, blanched, rinsed, dried, and bagged 12 quarts of green beans for the freezer, and we still have soooo many more. Thank you Justin for being overly ambitious with the planting this year. We will be eating green bean casserole all winter long. And I'm sure green beans will show up in every soup I make. Your favorite green bean recipes welcome! Not only did we get to go climbing with Kelly and Yann, AND celebrate their wedding, but we ALSO got to celebrate Kelly's birthday! You may have heard a lot about Kelly on this blog. Allow me to explain: Kelly is the kind of person you would love to be friends with. She is a beautiful, kind, adventurous person. When she climbs she is extremely focused and totally fearless. She is a ball of energy, genuinely cheerful, and makes everything we do together fun. She is also has a delicate side, and is very thoughtful and giving. Combine this with the fact that she is stylish, a great cook, and appreciates a good IPA and you have a universally awesome friend. (Also, she and Yann have an amazing apartment in Paris.) I considered it a privilege to throw her birthday party out at the farm. Unfortunately in the midst of hosting the party, I completely forgot to take pictures. So here are the few I did take, and I'll hope some others took more photos than I did! Keeping with Kelly's wedding theme and the style of our house, I went for a farm chic decor. I made a bunch of table runners out of blue and white ticking, as well as some coordinated seat cushions and a bench cover. I used some fabric scraps to make twine garlands all throughout the house. I also printed some photos from the reception and displayed them on twine with clothes pins, as well as various other places in the house. Most of the party took place out on the sunny front deck and in the garden. It was fun to have so many little ones at the party. Alicia's oldest even asked if he could stay for a slumber party. I took it as the highest compliment. Then it was time for the official Happy Birthday song (you can't get out of it, even when you turn 30)...with sparklers! For dessert I made a black- & blueberry cobbler, with vanilla ice cream. Sarah also roasted some strawberries and Amanda brought a batch of her famous brownies. Decadent. And I didn't even mention all the other food we consumed (feta-spinach-chicken brats, veggie kabobs, home grown green bean salad, delicious cheeses, fruit salad, green salad, awesome spicy pasta salad ala pete), or the s'mores we made on the bonfire for second dessert. For Kelly. In true farm style, we had a good old fashioned camp-out with our trusty Lovedog mobile and tents in the yard, and finished off the party with a blackberry pancake breakfast the next morning, and a farewell to Kelly & Yann. Kelly, I hope you have a fabulous birthday (TODAY!). We loved celebrating with you. I can't wait to see you again soon, whatever and wherever the adventure might be. Last weekend I had the absolute delight of spending three days (of glorious weather!) with the Roberts-Genton clan in celebration of Kelly and Yann’s wedding. 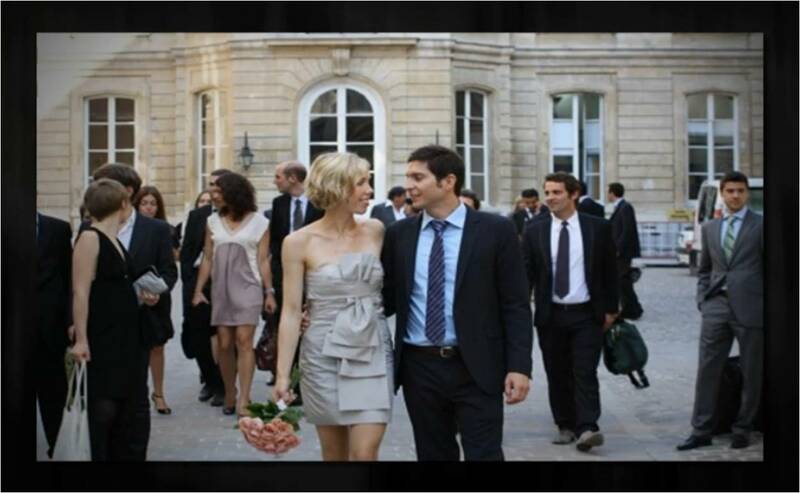 Yann and Kelly were officially married in September in a somewhat last-minute civil ceremony in Paris. It was last minute because Kelly was still in the process of getting her visa and other infinite paperwork (the words ‘consulate’ and ‘waiting’ were in her daily vocabulary) and once that was finally approved the court could assign them a date. The date assigned happened to be right in the middle of our cross country road trip, and though I looked for flights from Chicago to Paris and back to Burlington, Vermont (in 3 days) and about 5 other combinations of en route cities to fly out and back, it just couldn’t be done. And so Justin and I celebrated their union from Niagara Falls. Thankfully, Kelly was adamant about having the opportunity to celebrate their wedding with friends and family back here in the States, so a reception was planned in Olympia. Since Yann’s family was also coming over from Paris, a whole weekend of events also ensued. Friday night was a cocktail party at Aunt Libby’s (with root beer floats for dessert to the bewilderment of the French guests—"What is in root beer? "), a delicious breakfast the next morning, a girls hike to Priest Point, a golf day for the guys, a BBQ at Kelly’s dad’s (with a white elephant gift exchange—more bewilderment from the French at the absurdity of the "gifts"), and finally the reception Sunday afternoon. Kelly’s theme for the reception was a French picnic. Of course it turned out fantastic. Love you, Kel! So happy for you and Yann. Coming soon...Kelly's 30th birthday bash!